Hampton Inn & Suites by Hilton and Homewood Suites Denver Downtown Convention Center welcomes fans to the Summer of Love Tour at Bellco Theatre on Friday, August 5th, 2016. Fans will be treated to an incredible concert with Grammy-nominated Keyshia Cole, featuring other R&B singers, like Dru Hill. Tickets range from $59 to $125 and concert-goers are encouraged to arrive when doors open at 7 pm on August 5th. Fans are welcome to extend their plans and stay downtown the entire weekend at Hampton Inn or Homewood Suites. Both hotels are located just a short ten-minute walk from Bellco Theatre. For more information, please visit http://www.axs.com/events/311070/summer-of-love-with-keyshia-cole-tickets. At Hampton Inn & Suites, each guest room welcomes travelers with great amenities including free Wi-Fi throughout the hotel, complimentary daily breakfast buffet, 24-hour fitness center and business center, premium in-room movie channels and much more. The hotel offers guests a choice between king and queen rooms as well as accessible rooms, based upon availability. 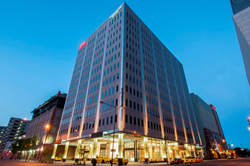 Hampton Inn is just a five minute walk from the 16th Street Mall.